“Our Coerced Silence Is The Weapon That Has Been Sharpened And Brought To Our Throats. This Is Why Nawaz Sharif's Statement In Defence Of Ahmadis Met With Such An Angry Response. Because The Heart Of The Issue Isn't Whether Ahmadis Are Non-Muslims Or Not. The Heart Of The Issue Is Whether Muslims Can Be Silenced By Fear. 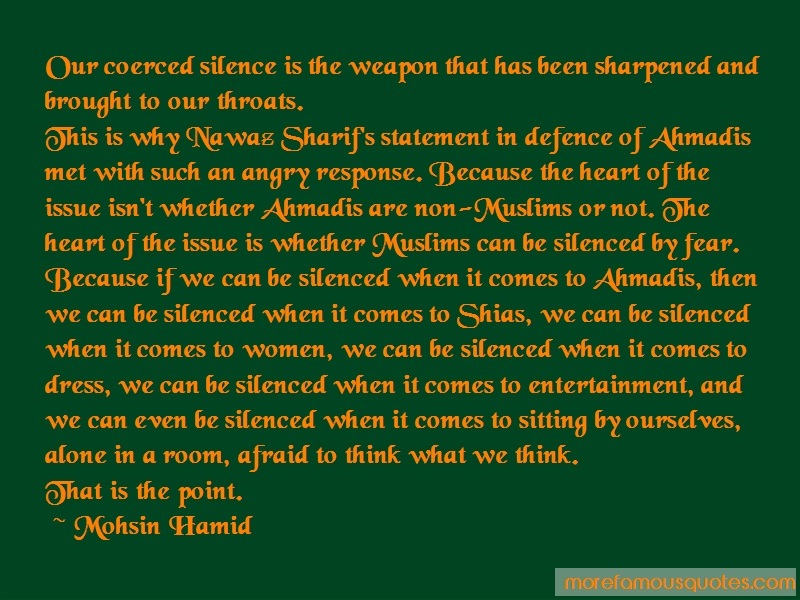 Because If We Can Be Silenced When It Comes To Ahmadis, Then We Can Be Silenced When It Comes To Shias, We Can Be Silenced When It Comes To Women, We Can Be Silenced When It Comes To Dress, We Can Be Silenced When It Comes To Entertainment, And We Can Even Be Silenced When It Comes To Sitting By Ourselves, Alone In A Room, Afraid To Think What We Think.